Connect all your favorite SEO tools into a single, awesome SEO report for clients! 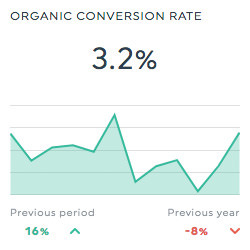 Organic traffic, Conversion Rate, Click-through rate, Keyword Ranking, Link Building stats… There are so many KPIs you need to be tracking in your SEO report, and picking the right ones for your business can quickly become overwhelming. Fortunately, this sample SEO report is a great example of the perfect template and a great starting point for your SEO reporting needs. 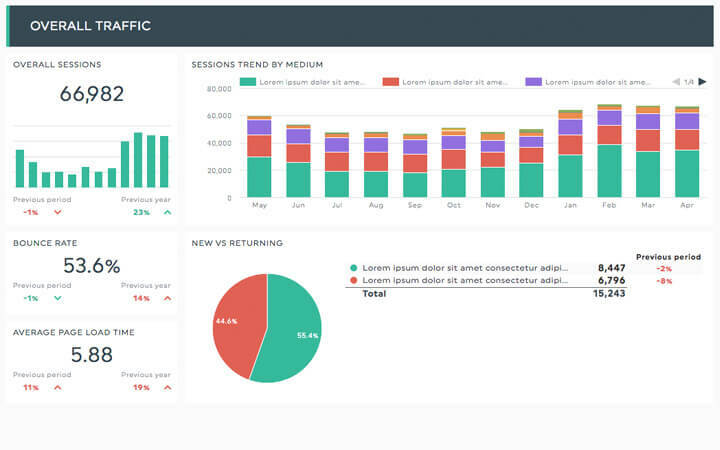 We’ve chosen the most popular, tried-and-true KPIs for your SEO report template. Start SEO reporting ASAP with our crystal clear sample SEO report! Want to see your own SEO key data in an awesome SEO performance report? Add your data to the best SEO report template immediately! Plugging your own data from across a multitude of SEO tools into our simple SEO report template is as easy as 1-2-3! Choose the SEO report template from the drop-down menu, and you’re all set! You can connect a multitude of SEO tools into your SEO report template, including Google Analytics, Ahrefs, SEMRush, Moz, Google Search Console, and WebCEO, among others! See your SEO data in DashThis today! 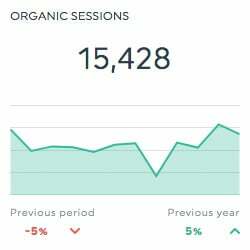 DashThis gives you the simplicity of a pre-built monthly SEO report template, the speed of automation, with the customization power you’d expect from a powerful reporting tool. Explore our SEO reporting tool! Choose from a wide variety of chart formats and pick your metrics, dimensions, segments, and any other settings to help you showcase your data the way you want to. Our SEO reporting template can be entirely customized to fit your brand. Custom URL, custom design, or even both! No need to start from scratch for every client: once you create a winning SEO report, just clone your layout, and change the data sources to your new client’s! Share your monthly SEO report template! It’s so easy to share your SEO report template with either your team or your clients, no matter where they are, no matter how they want to get their reports! Your clients will never miss their reports, and you’ll never have to send them manually again with our easy automated email dispatch; your clients or team will receive a link to access their SEO reports whenever they want, and you can even include a PDF copy of the report! Share your SEO report template with a URL. It’s easy, convenient, and your client or boss will be able to access your SEO report anytime, no matter where they are: on a mobile device, on their computer at home, on vacation, anywhere internet is available! Exporting your SEO report template as a PDF is as easy as can be! You can automatically attach your PDF reports to your email dispatch in the blink of an eye. You can also print them if you need a hard copy, or send them yourself to your team in an email! It’s up to you! No matter what kind of SEO report template you’re creating, DashThis makes it simple! Keep tabs on your competitors’ new backlinks, how many you’ve got, the domain name, the domain and page authority, etc. Get you favorite rank tracker data in DashThis and see how your keywords are ranking on various search engines, and how their average position evolves over time. Connect DashThis to your Google Analytics and Google Search Console accounts and keep track of how your organic search traffic is doing. Track your search visibility, keyword rankings and SERP positions, and identify opportunities in order to best outrank your competitors with a SEMRush report. Monitor your website’s SEO with a Moz report, and get a precise view of what’s working and what needs to be worked on. Build a report to keep track of how your competitors are ranking on search engines, and make sure your strategy points in the right direction. Need other types of marketing report templates? We’ve got your back! Take a look! Gather all your clients’ website key data in a single, nice-looking Google Analytics report for your client! Our Google Analytics report template gathers all the most crucial KPIs you should be tracking.